Christmas is the day of the greatest beauty and solemnity in Holy Church. As the great Doctor of the East St. Ephrem observes, all the other days of the year borrow their beauty from this day, and all the other Feasts owe to it their solemnity and loveliness. Dom Gueranger points out ways in the past that Divine Providence has privileged this day above all the rest of the year and desired certain significant events to take place on it. I have added other noteworthy dates to his list. I think it is important that Catholics begin to think about how God acts in History. Not all days are equal in Heaven’s Calendar, and Christmas Day – above all others – has a special relevance for all those who adore Jesus Christ the Savior. Now, to impress the nations of Europe of the importance of this day, God, Sovereign Ruler of all things, willed that on Christmas Day the Kingdom of the Franks was founded. At the glorious solemnity of the Holy Christmas Mass in Rheims in the year 496, Clovis was baptized by St. Remigius. "Bow thy head, O Sicambrian. Adore what thou hast burned and burn what thou hast adored," the Bishop said to the founder of the first Catholic nation. And that is what the illustrious Frank proceeded to do. A century later, England was converted to the true faith by the labors of St. Augustine of Canterbury. On Christmas Day 596 he baptized 10,000 men, not counting women and children, in the city of York. That year the Birthday of Christ counted one nation more as belonging to His Kingdom. Two hundred year after this, God provided us another glorious event in honor of His Son’s day of birth. 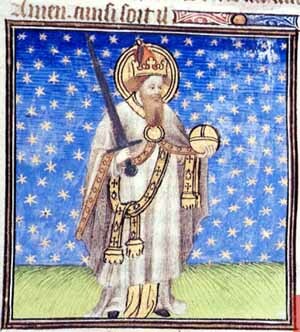 In the year 800, at the Basilica in Rome, the Holy Roman Empire was created as St. Leo III crowned Charlemagne Emperor. What a grand event on such a marvelous day! Thus began the most illustrious epoch in the History of the West. For God assigned to the Holy Roman Empire the lofty mission of propagating the kingdom of Christ among the barbarian nations and of maintaining the alliance and unity of Europe under that glorious title of Christendom. On Christmas Day in the year 1000, Eastern Europe has double reason to celebrate. For on that day, St. Stephen, the Grand Prince of the Magyars, was crowned first King of Hungary. St. Stephen would use the royal dignity to wipe out paganism, establish episcopal sees and make Hungary a Catholic nation. During the coronation, he held up the famous jeweled crown sent to him by Pope Sylvester II to offer it to the Virgin Mary and seal a divine contract between her and the future kings of Hungary. It was an exquisite act that made a special and eternal bond between the Queen of Heaven and the new Catholic nation on that Christmas Day. On Christmas Day 1066 in Westminster Abbey in London, the future of a new world was set with the coronation of William the Conqueror as King of England. The champion of the Papacy and of Church reform brought the strong Norman sense of law, order and precedent to the English country to replace the barbaric feudal anarchy of Old Saxony. 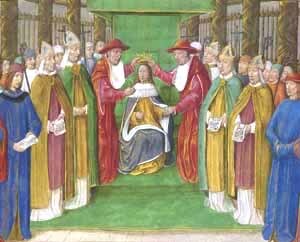 On December 25, 1100, God desired that Baldwin I of Boulogne be crowned the first King of Jerusalem. In this way, Divine Providence blessed on this holy day the efforts of the Crusaders who fought to preserve and hold those places where Our Lord Jesus Christ was born, lived and suffered His Passion and Death for mankind. The medieval chronicler Fulcher described Baldwin as another Joshua, "the right arm of his people, the terror and adversary of his enemies." He extended Catholic power in Palestine, defeated the Muslims at Akko and in Sidon, and invaded Egypt. 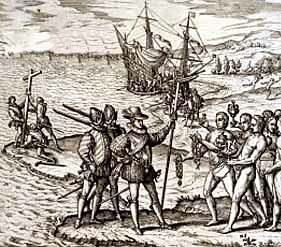 Some four hundred years later on the Christmas Day of 1492, Columbus established the first European settlement in the New World. When his Santa Maria caravel ran aground at the Dominican Republic, the great explorer founded La Natividad, so that the first settlement in our land bore the illustrious name ofThe Nativity. Thus began the epic Age of Discovery that brought the Catholic Faith and light of Christ to the lands of the three Americas, until then immersed in the darkness of paganism. 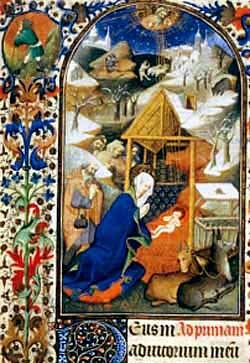 These are ways that God glorified the Divine Infant born this day in History, giving us worthy anniversaries of that Birth which gave glory to God and peace to men. This Christmas, there are still on this earth men and women of faith and good will – men and women who believe the promise of Our Lady at Fatima that Her Immaculate Heart will again reign and the Catholic Church and civilization will be restored. I am sure such faithful souls, remembering these events of past Christmases, will ask Divine Providence again to act in a special way on the birthday of Christ. Let us pray, then, that the Most High may again choose to magnify Himself and His Son on the day of the 25th of December and again make His light shine on our revolutionary and apostate world.